When creating software components, it is often forgotten that it has to be easy to use. 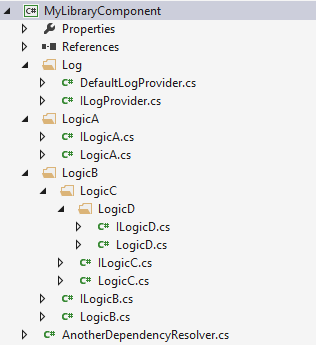 A lot of components are designed with an IoC and lots of unit tests. When using the component, the parent software should not need to create all the internal dependencies. This requires internal knowledge of the library which should not be required. A default way of creating a new instance should be supplied. The article demonstrates different ways of creating new instances of software components. Here’s an example of a basic library. The component is used by creating an instance of the IMyLibrary. This has dependencies to other interfaces. And again the child interfaces have dependencies to more interfaces. 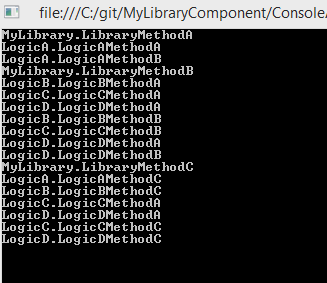 Even from this simple library component, it requires a lot of construction to create an instance of the library. For large components, this would become unmanageable. First solution; Create a basic DependencyResolver class. This class is very primitive. It just provides all the interfaces as properties and these properties can be replace with the parent project specific interface implementations, for example a logger. It is much easy to use the library now. The internals of the library do not need to be understood, it just needs to be constructed and it’s ready to use. If required, any part of the library can be replaced with a user specific implementation. The library remains flexible, easy to test and can be extended. Using the library is simple. Another solution would be to use an IoC container and create everything in the parent application. This works good, but internal knowledge of the library is required. Here’s an example using Unity. The first 2 solutions could be mixed, so only specific interfaces need to be resolved with unity. A more generic solution could also be used which would make it easier to extend the library as it increases in size. This example uses just simple construction injection for dependencies. The default library interfaces are registered. If the parent solution requires a specific interface implementation, the default registry is removed and a the new one is added. Due to this the end user of the library does not need to know anything about the internals of the component. This is then very easy to use. 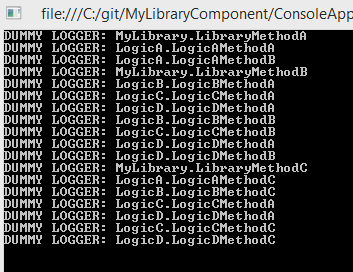 In the above code, the logger was replaced with the solution specific dummy logger. A good library needs to support all of these. A good library is easy the extend. It is important that any part of the component can be replaced.